ERNEST EUGENE CINQ-MARS was never elected to the House of Commons, yet he left his mark. A native of St. Edouard de Lotbiniere, Québec, Cinq-Mars found himself, in May of 1906, in the employ of the Montreal French-language daily, La Presse. 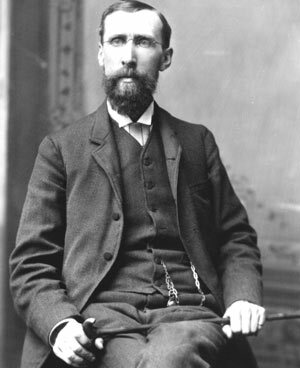 Parliament had recessed and Cinq-Mars decided to file a vicious commentary on the recent parliamentary conduct of opposition member and former finance minister, George Foster (pictured, right in May of 1889). The article was published May 26, 1906. On June 6th, when the House reconvened, Foster rose and tabled a most extraordinary motion: that Cinq-Mars' comments constituted a breach of parliamentary privilege - so much for freedom of expression. "... for further examination regarding certain statements contained in an article published in the La Presse newspaper". Even more surprising was that Foster secured support for his motion from Liberal Prime Minister, and Quebec lawyer, the Right Honourable Wilfrid Laurier. It was the only time a journalist was ever called to the bar of the House of Commons of Canada and even in 1906, it had not occurred in a Commonwealth parliament since 1830. "...the shower of gratuitous insults that this old parliamentarian incessantly dashes into the face of the inhabitants of the province of Québec, of the French Canadians. And it is Mr. George Eulas Foster, a politician of sorry celebrity, who sings this refrain in the Commons. "He has but one principle - self-interest, but one desire - to insult. He belongs to the school of lying, hypocrisy and cowardice. "In his eyes, the man for whom civic and political virtues are not vain words, is an imbecile, a hot-head." Of that, Cinq-Mars would soon have a more informed opinion. He complied with the order to attend the June 14 sitting and approached the bar of the House upon the Sergeant-At-Arms beckoning. GEORGE FOSTER (North Toronto): I stand here in my place as a man and as a representative of the people, and claim my right, as a member of parliament, to be protected against an assertion like that spread broadcast without warrant. I appeal to parliament to protect me and every member of parliament, and itself, against possible allegations of that kind, and of that nature. MR. SPEAKER - Robert Sutherland (North Essex): Mr. Cinq-Mars, upon what actions, conduct or expressions of the member for North Toronto did you base the statements contained in the article under consideration? EUGENE CINQ-MARS: Mr. Speaker, my political writing is in no way exceptional as far as the ordinary tone of present-day polemics is concerned. It would be impossible to read the speeches and writings of the hon. gentleman without feeling impressed with the idea that, in his eyes, the French Canadians are the slaves of bishops who keep them in ignorance. It is easy to understand what he means when he compares the bishops of Quebec to the grand dukes of the autocratic Czar of Russia, when he says that they control with their influence the Prime Minister and his colleagues. I am informed that, during the election campaign of 1896, at a public meeting held in Renfrew, Ontario, Mr. Foster pronounced the following: "Would it not be a disgrace and a shame for this fair Dominion of ours to have at the head of the government a French Canadian and a Catholic at that?" As a member of the Liberal party, I thought it my duty to sharply take up such utterances on the part of a public personage. RIGHT HON. SIR WILFRID LAURIER - Prime Minister (Quebec East): Mr. Speaker, if my hon. friend (Mr. Foster) will reflect, when his head is on his pillow, upon his career, perhaps he will admit that there was some justification for the article. But I come to a paragraph in these words, "he has but one principle - self interest; but one desire - to insult. He belongs to the school of lying, hypocrisy and cowardice." That passage passes the bounds of reasonable criticism and constitutes a breach of the privileges of this House. The press must understand that, while it is possible and not only possible but fair and within their rights, to criticise the acts of any public man, they must do it in language that is fair and not in language of mere vituperation. ROBERT BORDEN - Leader of the Opposition (Carleton): You could hardly imagine a greater license than that which this young man permitted to himself in characterizing the utterances of my hon. friend from North Toronto. Nothing could be more truly desired by every hon. gentleman in this House than that the people of this great Dominion, embracing divers races and creeds, should understand that no ill-will or hatred exists against them among those of different race and different creed. The better they understand each other the less cause there will be for any prejudice in the future. "... that the passage in La Presse newspaper complained of, pass the bounds of reasonable criticism and constitute a breach of privilege of this House." With that, Cinq-Mars was discharged, without further ado. Laurier had angered some of his members by allowing the motion to summon a Québec Liberal journalist in defence of the disliked Foster. But in the days that followed, his Québec backbenchers accepted the exercise as reasonable protection of the dignity of the House. Cinq-Mars joined the Canadian Army in 1915 and was awarded the French military decoration for heroism, the Croix de Guerre, in 1917.